Order - If this ship is staffed and at a non-headquarters mission, this mission's owner places a card from hand on top of his or her deck. You may do this only once each turn. "Are you telling me that one of the most heavily armored warships in this quadrant is now in the hands of Maquis terrorists?" Characteristics: affiliation, Maquis related, manipulate your hand, Defiant-class, Cloaking Device, U.S.S. 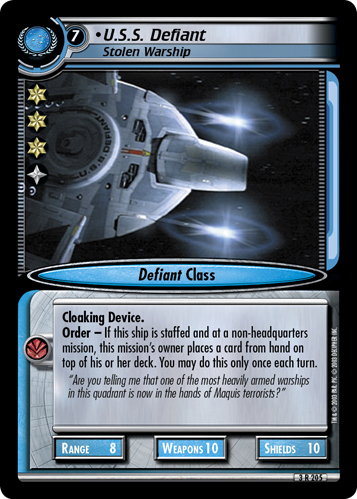 Defiant, ship with four or more staffing icons. 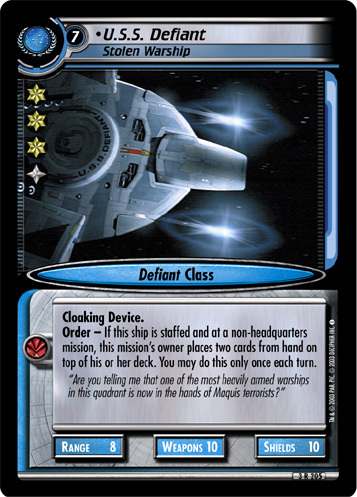 This card has an erratum: The Maquis Defiant has been altered to reduce the effect of its ability, dropping the number of cards from two (2) to one (1). This preserves the flavor and function of the card while reducing its power. Note that a previous errata to this card corrected a misprint from Adversaries Anthology. Game text before errata: "If this ship is staffed and at a non-headquaters mission, this mission's owner places two cards from hand on top of his or her deck. You may do this only once each turn." Card logging info: First edited by Telak at May 13th, 2013. Please support openCards and validate game text of this card! There are 18 entries for U.S.S. Defiant, Stolen Warship (ST2E 3 R 205) at the Tradeplace (26 haves and 5 wants). Click here to see all trade list entries for this Rare card!